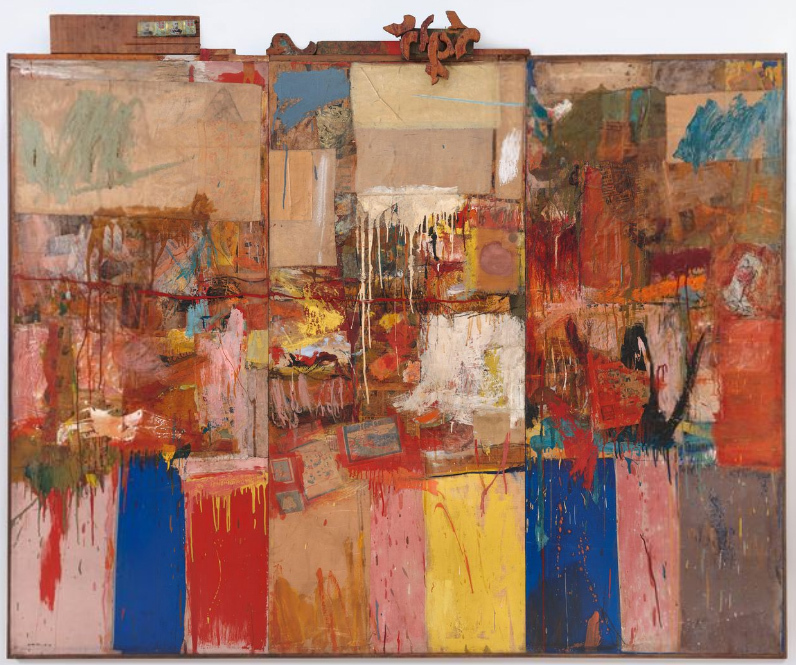 Because of their historical position, Rauschenberg and Johns were able to assert the pictorial aspects of their work over the literal, thereby defeating objecthood, by harnessing the power of the Abstract Expressionist brushstroke. They may have been sceptical over its emotional or psychological origins, but fully endorsed its functionality. The achievement of post war US art was to raise the cultural value of painting to a new height and to associate this with the signature pigment handling which came to define it as a style. The brushstroke became an icon for painting as a medium. 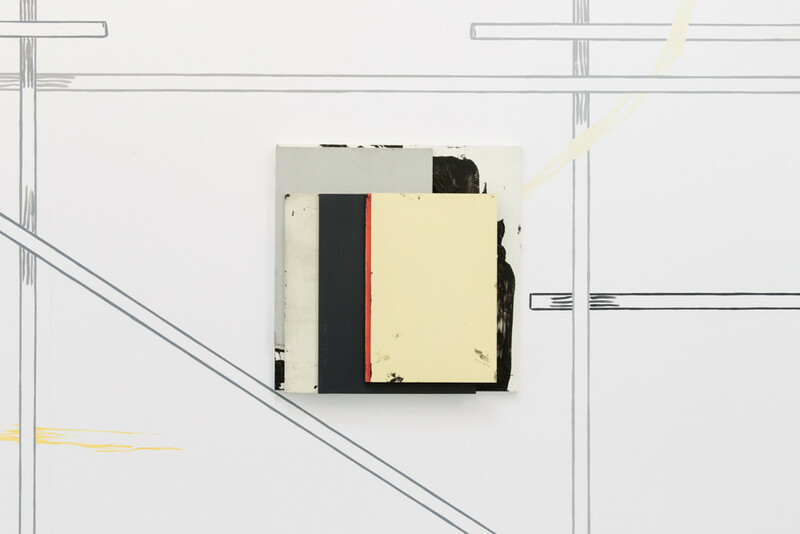 They used this feature not just to defeat but rather to obliterate objecthood by covering their hybrid ‘combines’ and ‘assemblages’ with the gestures that invoked painting’s hegemonic period, loading their work with the repeated sign for painting itself. As anyone will tell you, the cultural capital of painting collapsed towards the end of the sixties. Not only did the brushstroke become a sign for a medium of limited relevance but also appeared increasingly to be an undefendable way of defining that medium in altered circumstances. Those circumstances haven’t changed much, but in the meantime painting has often tried to move outwards into the third dimension while somehow retaining its identity. One way of doing this, fitting in with the conceptual insecurity that the artform suffered, was the idea of ‘deconstruction’, meaning a process of breaking the practice down into its constituent elements, analysing the things that made painting what it was. This sort of ‘deconstruction’ is not of course quite what Jacques Derrida was going on about. It’s nearer to that recognisable from MasterChef, where somebody ‘deconstructs’ rhubarb crumble or steak and kidney pie. Instead of the compound dish, a contestant will separate the components and reorganise them more elaborately to show their individual characteristics to greater effect, but also missing the point. Painting is a compound resource and therefore can be reorganised, or deconstructed, in a variety of ways. Some examples may reiterate the conventional, wall-based rectangle while others move into full three-dimensional formats. Craig Staff, in an essay on this site linked to the ‘Real Painting’ exhibition at the Castlefield Gallery, Manchester, last year, mentions the ‘grammar of the pictorial’ as a common factor and lists ‘support, surface, facture, form, colour and ostensible flatness’ as themes or topics that linked the exhibitors. [ii] These can be recognised as painting’s ‘norms’, which may be projected and articulated even when there is no actual painting, only an object, to look at. This kind of approach, which emphasises separately itemised normative features, (support, surface, facture, etc,) encourages both practitioners and viewers to treat painting as ‘a thing in the world’. By that I mean simply that the work is optimally encountered fully embedded in the world, which carries on as usual around, through, and under it, the given continuum constituting the fabric of ‘reality’ remaining intact. This seems different from the experience offered in a standard painting. ‘Norms’ figure in Clement Greenberg’s 1960 essay ‘Modernist Painting’. In ‘After Abstract Expressionism’ published two years later, he writes of the ‘irreducible essence of pictorial art’ residing in two ‘indispensable’ norms, namely flatness and the delimitation of flatness. [iii] Only these, he says, have to be observed for a painting to be a painting, a formulation that is technically fulfilled by the extreme minimum case of the ‘tacked-up canvas’. Greenberg’s texts probably appear now like rather dog-eared pieces of art theory, but there’s something about that tacked-up canvas that might give pause for thought. What it amounts to is an exclusion zone; what it excludes is everything else. The tacked-up canvas, which ‘already exists as a picture’, is a way of showing that painting is not a ‘thing in the world’. It starts as a gap or hole in that world. Unless it makes this initial clearing, painting can’t go on to fill the breach with its own ideas of possible worlds, including a world that looks remarkably like the one it excludes. Many of the exhibits in ‘Real Painting’, aimed to escape the pictorial condition by following the ritual autopsy of deconstruction and engaging in freestanding normative exercises. Maybe because of the associations of pictures and figuration, turning the pictorial domain, which seems to have been declared non-compliant, into a more acceptable ‘thing in the world’ appears to involve a process not unlike abstraction. It’s as if ‘real painting’ was ‘abstracted’ from painting in the way Mondrian’s plusses and minuses were abstracted from the pier and ocean. The results also obviously demand to be understood and appreciated as fully abstract art, the outcome of self-referential reflection brought to bear on a specific medium, which used to be the hallmark of the modernist project. 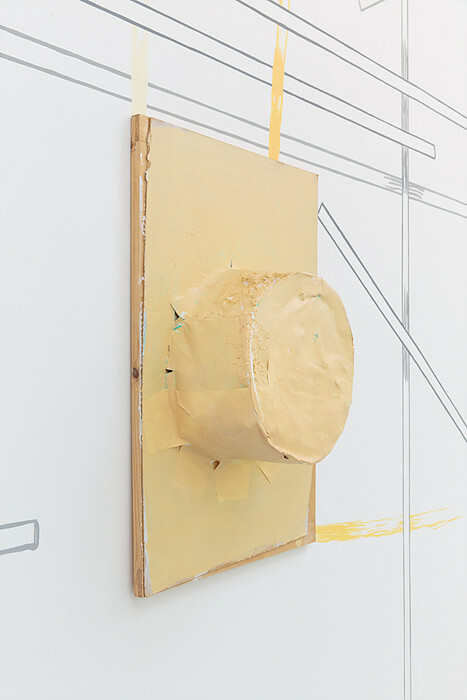 A common strategy in the Castlefield show, used by Angela de la Cruz and Jo McGonigal, was to un-tack the canvas and detach it from the stretcher. Others, and the artists on view in ‘Slow, thick fingers’,[iv] sought perhaps to dethrone the pictorial domain while still hanging on to its salient features, including its ancient exemption from the otherwise total category of things in the world. They attempt to make work that straddles the line dividing painting from everything else. But there also seems to be a tendency to target small, framed paintings and panels, the portable easel picture, already looking a bit like an object, which can be parked, stacked or placed in a variety of constellations. This might just be interpreted as another example of painting’s complex relationship with the object, a discourse it has conducted for some time, mainly in one direction. It has always wanted to incorporate objects but alter them to suit its own purposes by submitting them to the painting process. Historically, an extensive inventory of objects has ended up in paintings, by being painted. The list includes Adam and Eve, Jesus Christ, animals, fruit and flowers, ruins, kings, queens and popes, hay wains, black squares and black stripes. Being in a painting gives things a cultural value by virtue of being inducted into this tradition of paintedness. [v] The exhibits in the two shows under discussion are explicitly painted, but not rhetorically, with the Abstract Expressionist brushstroke as a sign for painting as a category. However, just being painted establishes their claim to be treated as part of that tradition. A painted object has a different life from that of an image. The most obvious example of a painter who dealt with things in the world is van Gogh, who demonstrates how the identification of pigment and object adds a level of meaning that a mere reference would lack. The chair in his painting of 1888 is built out of yellow with each part literally transcribed in the correct arrangement[vi]. The legs are robustly braced by the horizontal rails glued in their sockets, the back securely joined into the uprights, the rush seat visibly taut, on which are placed the pipe and the tobacco, the quarry tiles below, the wall, the door, the planter, the bulb. To look at the paint is to look at the things. 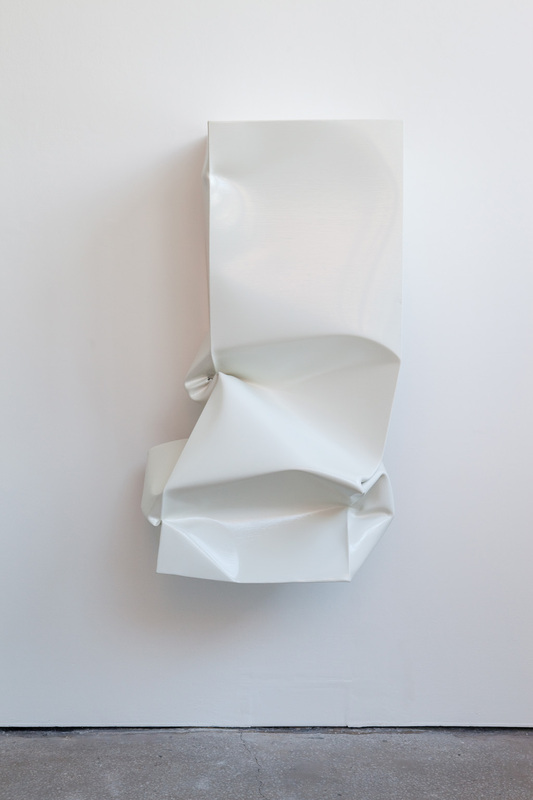 In John Wallbank’s piece’, ‘No Title’ (2013) in ‘Slow, thick fingers’, to look at the things is to look at the paint. 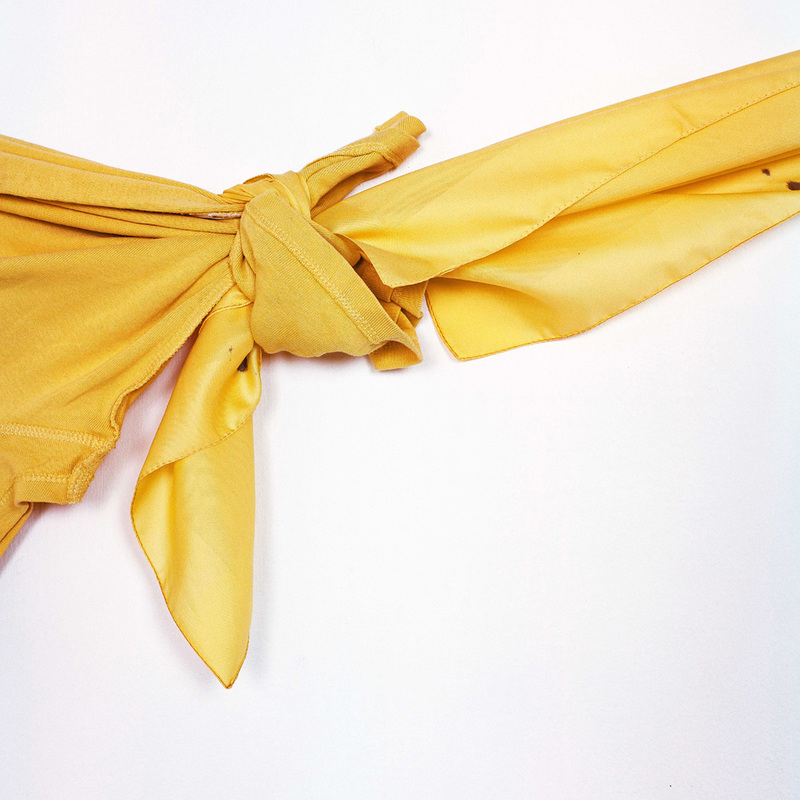 It too is built of yellow that coincides with an object. This is a closed cylinder, but attached to a backplate in the shape of a rectangle, which echoes the picture convention. Alaena Turner’s ‘Secret Action Painting 7’, (2016) is assembled from juxtaposed pictures, that seem glued together by a layer of pigment, with the cropped panel on the top of the stack reading like a shape in a generic, geometric abstract style. 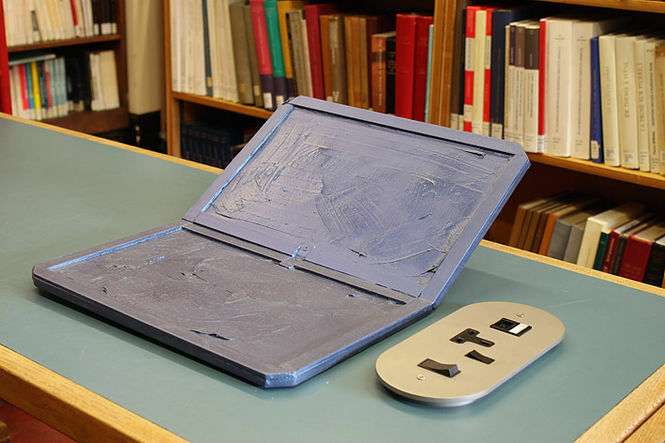 Her earlier work ‘Technophobe’ (2013) illustrates the paintedness thesis very conveniently, being a lap-top lagged with a thick coat of grey. In both cases the tradition of paintedness seems key to understanding the work. As I have said, an object that falls within the remit of painting, or participates in the tradition of paintedness, is not the same as an image. An image is a reference. 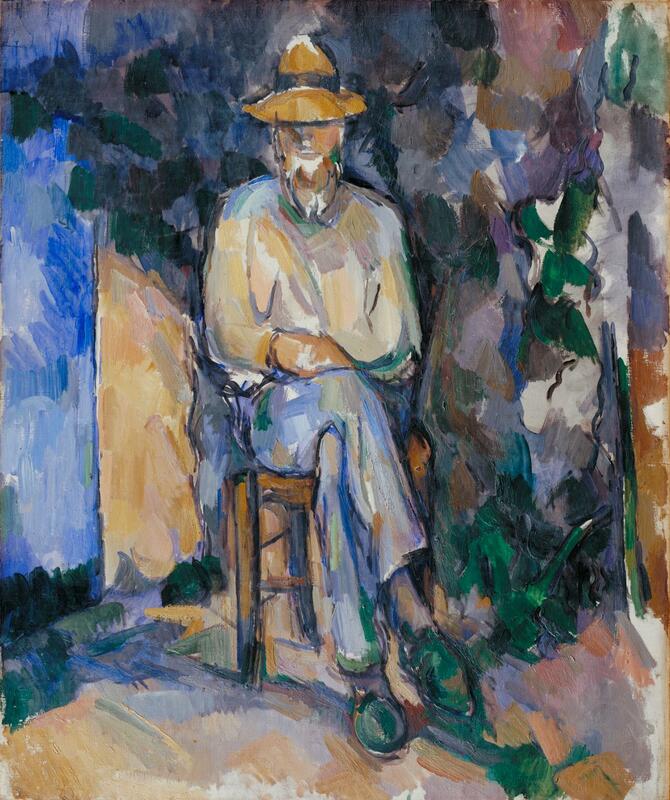 There is a chair in Cézanne’s painting of his gardener, but it is not an object. [vii] It is the image of a chair, on which is an image referring to Vallier, in front of a reference to a wall, maybe a door and a swathe of green foliage. But the paint does not coincide with the objects, in contrast to the van Gogh. What’s painted are Cézanne’s ‘sensations’ experienced in front of the motif, his ‘mental’ events made as solid as things in the world. The favouring of the object over the image in the work I have been discussing, suggests that painting is a good medium in which to critique the limitations of the image, a phenomena that increasingly dominates our visual universe. Compared to the object, images tend to be elusive and transferable. They are without texture and, unlike objects, systematically elude our animal grasp. The tactility of pigment, when serving the interests of the object, adds grip to the visual encounter. I want to speculate that what might be construed as a return to tactility in our dealings with the pictorial could be caused by the unannounced death of photography, painting’s old adversary. The dematerialisation of photography has taken hold relatively recently. A form, so dedicated to the image, has proved a little too palpable and finds itself abandoned and superseded by a dense field of pixels. Because of its reproducibility, the photograph should have been bereft of the ‘aura’ often claimed for works of art. However, when it is seen against the vast amount of non or post photographic images, the photograph, however many times it might be reproduced, begins to reveal something close to the auratic. The aura might still be available in the historical photograph, in albums and wallets, but not in the digital version, lodged in some rarely visited region of the hard drive. The almost uncountable number of digital images that constitutes the global visual archive takes up a negligible amount of physical space. Regardless of the date they were created, they all exist in a permanent present. They don’t suffer degradation or ageing, or lose definition in any process of retrieval or copying. They aren’t reproduced, but summoned on demand from the domain they inhabit, kept in the perfect condition of pure information. And they will continue forever, or, that is, until the empire of the internet goes the way of all the other empires. Images stored in the artificial photosphere generated by computer technology, which cannot be reached by our animal grasp, may create a need to restate the tangible and palpable in exchanges that take place elsewhere in visual culture. The artists in the two exhibitions may be consciously or unconsciously responding to this context by creating works that are part paintings and part things in the world. Paintedness obviously provides a bridge between the two domains. The trouble is that, in its coalition with the object, the role of the painting part in these hybrid works tends to be limited. Decisions that really matter focus on the activity going on in the structural support, which is often complex, or at least distracting. The positioning of the various components forming the object catches the attention, defining the work but leaving the paint a secondary role. Touch and gesture, when associated with fabricated ‘things in the world’, mitigate and soften, providing patination and minor surface incident and a kind of shabby chic aesthetic. In a pictorial context, in contrast, they would have far greater impact and leverage. In terms of the evolution of visual culture, it may be that the hybrid or ‘part painting’ could be a rung above ‘whole painting’ and more suited to progressive contemporary sensibilities. In its ‘pure’ form, painting is seen as an unreconstructed institution in a period that prefers institutions to have been through a crisis of renewal, changing them into something less privileged. The deconstructive aims motivating the work in the two exhibitions seek to reorganise painting’s resources and reduce its historical privileges, in particular its right to exclude itself from ‘things in the world’, in order to produce worlds of its own. Maybe, as with the MasterChef rhubarb crumble, that’s missing the point. 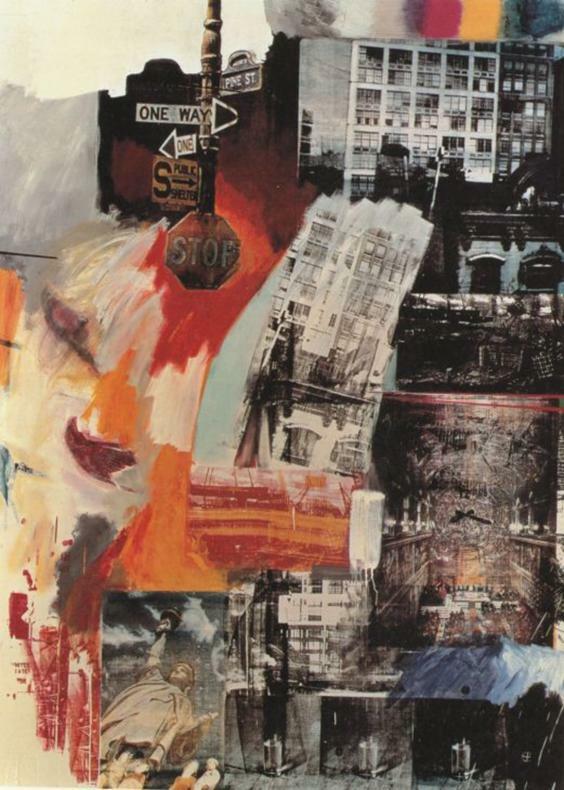 [i] Robert Rauschenberg: paintings, drawings and combines, 1949-1964, Whitechapel Art Gallery, London. February-March 1964. Jasper Johns: paintings, drawings and sculpture, 1954-1964, Whitechapel Art Gallery, London, December 1964. [iii] Clement Greenberg ‘Modernist Painting’ (1960) and ‘After Abstract Expressionism’, (1962) in Clement Greenberg, The Collected Essays and Criticism, vol. 4, 1993, ed. John O’Brien. [v] See David Sweet, ‘Meaning Value and the Tradition of Paintedness’, Artscribe 7, July 1977. 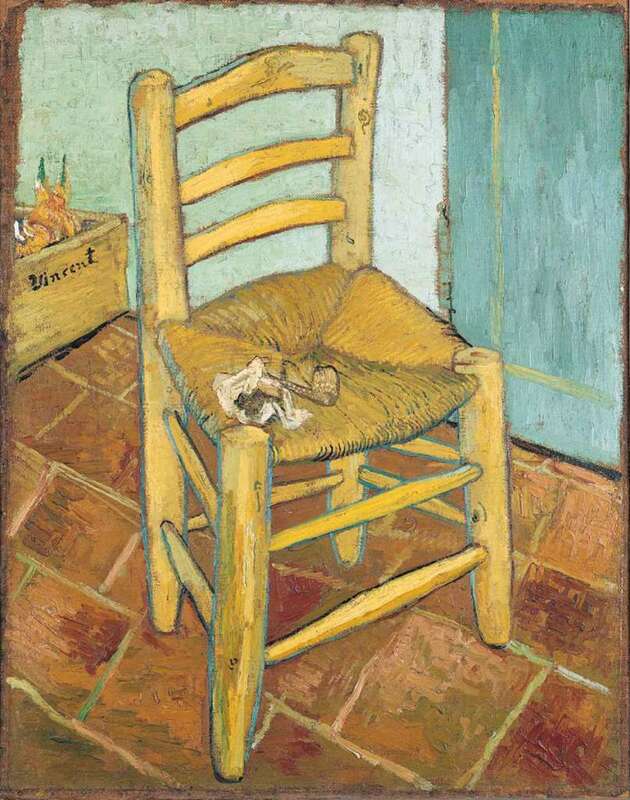 [vi] Vincent Van Gogh, Van Gogh’s Chair, 1888, National Gallery, London. [vii] Paul Cézanne, The Gardener Vallier, 1906, Tate Gallery, London. [viii] This is a trite reference to Michael Fried’s Why Photography Matters as Art as never Before, 2009. In Chap 4, his discussion of Roland Barthes’ Camera Lucida covers carefully some of the territory that I have rather crashed through. [ix] Clement Greenberg, ‘After Abstract Expressionism’, 1962. Thanks to David Sweet for the thought provoking essay. I have a couple of comments on specific passages. Rauschenberg and Johns recognized the exhaustion of Abstract Expression and commented on it by way of irony, specifically, the irony of using painterly effects (referred to by Sweet as “repeated signs of painting”) in connection with objects that were manifestly not paintings – either three-dimensional things (Johns’ beer cans) or flat two-dimensional things (flags, targets). But irony is a literary rather than a pictorial value, which is why the work of Rauschenberg and Johns is closer to Pop Art than to, say, color field painting. So I would say that their “hybrid combines” did not so much “obliterate” objecthood as evade the issue altogether. 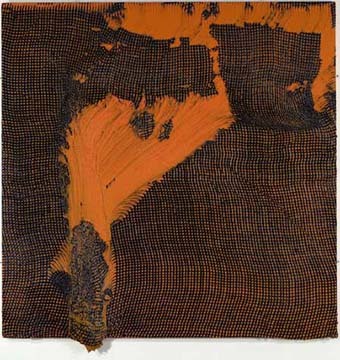 Also, “obliterate” suggests that the defeat of objecthood is something that occurs once and for all, whereas in Fried’s work objecthood is never fully defeated but only staved off from time to time in the experience of particular works that manage to succeed as paintings or sculptures at a time when the very existence of those media is under dire threat. That objecthood is never fully defeated but only staved off (which is a matter of one’s experience of particular works is illustrated in the example of Frank Stella. I believe that Stella’s early paintings were most definitely not “exempt” from the critique of literalism (if only self-criticism). Stella’s early stripe paintings demonstrate Stella’s acute awareness of the issue of objecthood insofar as those paintings explicitly took painting about as far as it could go (without being a blank expanse of stretched canvas hung on the wall) toward objecthood without declaring their existence as mere objects. The mere fact that the early stripe paintings deliberately and circumspectly undergo the risk of being seen as objects shows that these works were not exempt from the critique of literalism. In fact, it would not be too much to say that the artistic significance of the stripe paintings consists in nothing more (or less) than their willingness to expose themselves to that critique. With the irregular polygon paintings of 1966, Stella seems to have decided either that the risk was too great or that the deliberate courting of artistic disaster led to a dead end. But in both the stripe paintings and the irregular polygons, it was not the “pictorial activity” of the depicted shape that “defeated objecthood.” Rather, to the extent that objecthood is defeated (or as I prefer to say, staved off), it was due to the way in which depicted shape is seen in explicit relationship with (or as Fried says, “acknowledges”) literal shape. In the stripe paintings, the relationship is one of reiterating or echoing the painting’s literal shape. But Stella apparently decided at some point that reiterating or echoing is too inert a relationship to amount to acknowledging – hence the decision to produce shaped canvases (V-shapes, W-shapes, etc.) in which the literal shape may be experienced as generated by the bands comprising “depicted” shape as much as the reverse. In the irregular polygons (as described by Fried in “Shape as Form”), the relationship between literal and depicted shape becomes itself illusive, such that these paintings, when they succeed, cannot be said to have a literal shape at all. My point is that the “defeat of objecthood” – and therefore the achievement of abstraction, which is the same as the achievement of pictorial quality – is never secure but always unstable, and this instability expresses the fact that the defeat of objecthood (and therefore the achievement of abstraction) is not and cannot be a quality that is predicated (once and for all) of things in the world (like color, shape, weight and so on). a. Although not especially relevant to the argument, the idea that photography is “painting’s old adversary” assumes that painting is in competition with photography. This cliché has been around since photography was invented but it remains as much without foundation as it ever was. Because the medium of photography is radically different from the medium of painting, painting is no more in competition with photography than it is with, say, music or poetry. c.	To assume that digital photography has “killed” photography as such is to assume that we know what the medium of photography (as such) is, and specifically that digital photography has radically altered or made irrelevant the medium of photography. To my knowledge both assumptions are inaccurate. We don’t know (or at least I don’t) that “the apparatus of viewfinder, lens, lightless box, acetate, emulsion” are essential components of the medium of photography such that their supersession by other technologies implies the death of the medium as such. Furthermore, an iPad (more accurately the camera built into the iPad) requires an “operator” (to use Roland Barthes’ unfortunate term) as much as does a traditional camera, and the fact that the digital image “may be ‘saved’ as a short or long clip or single shots, or not saved at all” does not distinguish it from the traditional photographic image made through chemical rather than electronic processes. The point is that the question of whether or not photographs are “a thing of the past” can be answered not by theory but only by the continued existence or non-existence of particular things that we call “photographs”.